Bugatti had plenty to showcase at Pebble Beach this year, unveiling not only the final Legend edition but also bringing the entire series together for one big happy family reunion at the same location where, one year ago, it presented the first such special edition. But those weren't the only special edition Veyrons on hand in Monterey this week. When we first saw this yellow and black Veyron driving around Alsace last month and figured at the time that it must have been the final Legend edition in tribute to Elisabeth Junek. It turned out to be neither when the series closed out with the Ettore Bugatti edition with a decidedly different color scheme, which left us scratching our heads as to what the Bumblebee treatment was all about, but now we know. In addition to the Ettore Bugatti edition, the most exotic French automaker also arrived at Pebble Beach this year with the Veyron Grand Sport Vitesse 1 of 1 edition. Commissioned by a customer in Singapore, this one-of-a-kind Vitesse roadster revives a favorite color scheme of the Bugatti family that adorned many of its vehicles from the company's heyday, including a Type 41 Royale, a Type 55 and a Type 44 like the one beside which it was presented, furnished for the occasion by the Mullin Automotive Museum in Oxnard, CA. The black and yellow livery continues from the exterior into the open cabin with its laser-perforated leather and also features an anodized, hand-polished grille laser-cut with the owner's initials PL and a Bugatti logo placed on the underside of the rear wing . Scope it out in the high-resolution image gallery above and the press release below. - True to Ettore Bugatti's motto "Nothing is too beautiful, nothing is too expensive"
Molsheim / Pebble Beach, 18 August 2014. Bugatti presented a special car, the Veyron 16.4 Grand Sport Vitesse1 "1 of 1", on Saturday in Pebble Beach, California. This edition of the fastest production roadster in the world impressively demonstrates a core competency of the French luxury brand, namely customisation. The Grand Sport Vitesse "1 of 1" takes inspiration from the brand's historical designs and vehicles. The result is a unique supercar which Bugatti president Wolfgang Dürheimer personally presented to the future owner from Singapore. "The Bugatti Veyron is an iconic car, which has set benchmarks in many respects", said Wolfgang Dürheimer, President of Bugatti Automobiles S.A.S. "In addition to the certainty of owning the world's fastest production sports car, exclusiveness is extremely important to our customers. This is the reason that we have always placed so much focus on customisation and personalisation at Bugatti." "For our customers, a Bugatti is an investment in an automotive work of art which will endure for generations. This is why every Bugatti is both unique and absolutely authentic in its technical prowess and stylistic form," emphasises Achim Anscheidt, Chief Designer at Bugatti. In the creation of the Grand Sport Vitesse "1 of 1", the Bugatti design team and the customer took their inspiration from Bugatti's history. 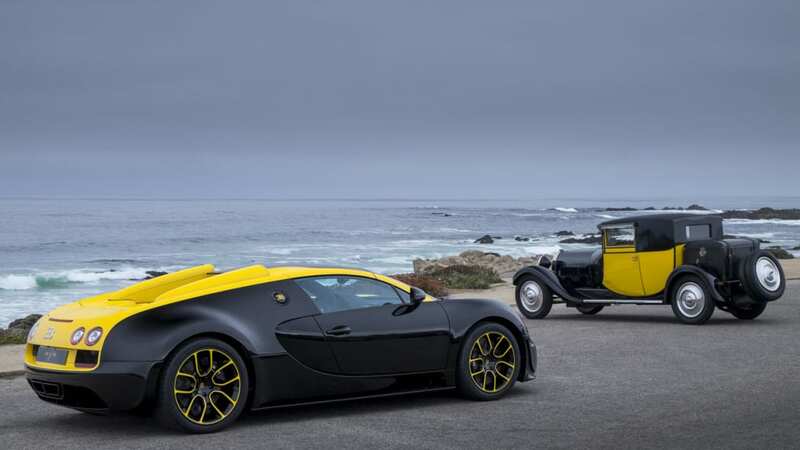 The carbon-fibre body of the "1 of 1" was produced in black and yellow, reviving the historical Bugatti family colours. This colour scheme and the split will be exclusive to the Grand Sport Vitesse "1 of 1". 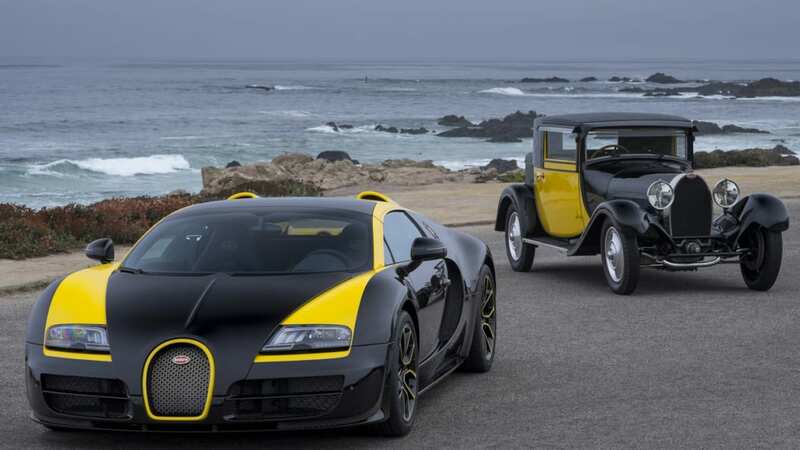 Company founder Ettore Bugatti and his son Jean had a number of important cars finished in the classic duo-tone combination of black and yellow, including the Fiacre bodies of the Type 41 Royale, the Type 55 and the Type 44. For this reason, the "1 of 1" was presented to the customer next to a Type 44 which was provided by the Mullin Automotive Museum in Oxnard, USA, especially for this occasion. 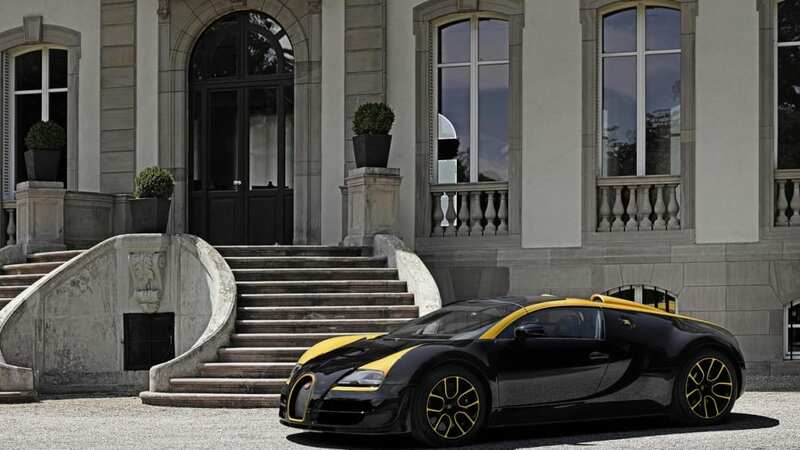 The black-and-yellow colour scheme went beyond the vehicles themselves at Bugatti. Even the beams over the old oak gates of the Bugatti headquarters in Molsheim, Alsace were painted in these colours. The Bugatti designers gave the historical colour combination a modern interpretation and developed an exclusive design which makes the Grand Sport Vitesse "1 of 1" unique. Most of the body is exposed deep-black carbon divided by a "1 of 1" yellow tone, developed together with the customer, applied to sections of the front wings, beginning beneath the headlights and tapering as it extends behind the doors. The A-pillars, the air scoops, the engine cover and the striking rear wings are also finished in "1 of 1" yellow. The wings were finished in a very special way. Sections of the carbon-fibre body parts were given a top coat while others received a clear coat. The differing finishes require substantial technical effort and highly skilled workmanship because the carbon-fibre layers must be differently applied exactly along the future colour boundaries in order to attain the weave patterns required for the clear-coated exposed carbon fibre and top-coated carbon fibre. 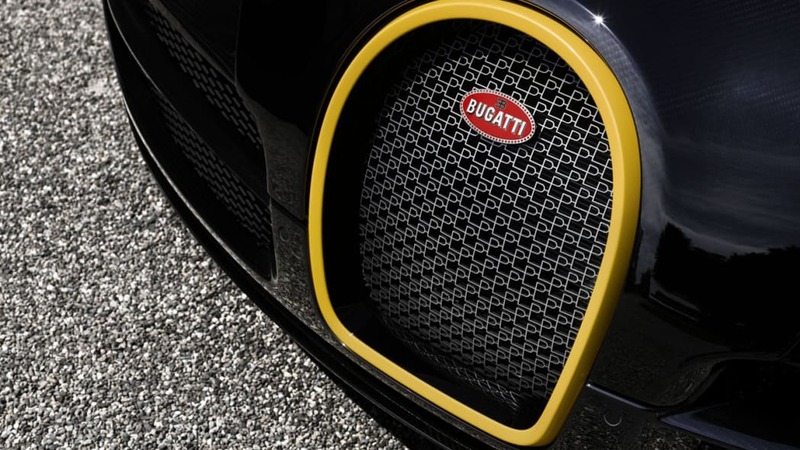 The legendary Bugatti horseshoe on the front grille is yellow on the front part while the inner section is black. And it is impossible to overlook the wheels of the Grand Sport Vitesse. The rims are painted black and yellow. 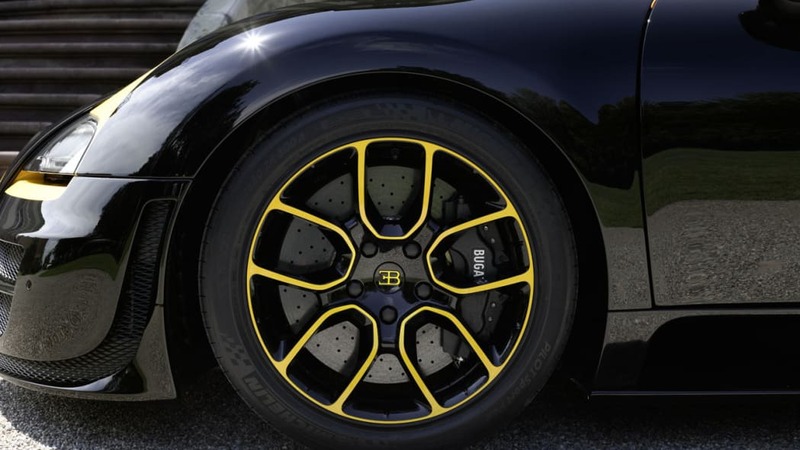 The rims with the unique dual tone are an exclusive feature of the Grand Sport Vitesse "1 of 1", and the initials of Ettore Bugatti on the hubcaps likewise glow in yellow. This detail also appears on the oil and fuel flap. For the first time, Bugatti has specially designed the radiator grille in the Bugatti horseshoe at the customer's request. The traditional expanded mesh grille was replaced in the Grand Sport Vitesse "1 of 1" with a grille in which the customer's initials, "PL", were laser cut. In an extremely complex process, which Bugatti developed and patented, every inner surface of the grille was hand-polished. After that the grille was black-anodised, then the front was polished and the grill was finished again with a natural anodised layer. More than 200 working hours are needed to attain this special, luxurious anodised duo-tone appearance in the finest quality. The customer's wish to express the historical roots of Bugatti in his Grand Sport Vitesse "1 of 1" was expressed in another detail of the car which cannot be overlooked: the brand logo, lovingly called the Bugatti "macaron". Company founder Ettore developed it himself, injecting his sense of workmanship and his love for luxurious detail, just as he did with his cars. An engineer to the core, Ettore Bugatti specified that the oval shape of the logo should be twice as long as it is high, as if one were to cut a tube at a thirty-degree angle. The name "Bugatti" is set off with a black shadow, over which the initials of Ettore Bugatti are elegantly placed. These initials, incidentally, are also used independently of this logo. Both elements are surrounded by sixty dots reminiscent of a string of pearls which increase the impression of elegance. The Bugatti logo still embellishes every Bugatti today and looks especially authentic as an enamel badge. In this form, the character of the logo upon which Ettore Bugatti placed such great value is well expressed: it is a hand-crafted work of art. The Bugatti logo is among the most elegant automobile logos in the world today. No other modern Bugatti displays the Bugatti macaron as prominently as does the Grand Sport Vitesse "1 of 1". In addition to being displayed in its traditional place as an enamel badge on the grille of every Bugatti, here it appears in black on the yellow underside of the rear wing when it extends at 180 km/h. 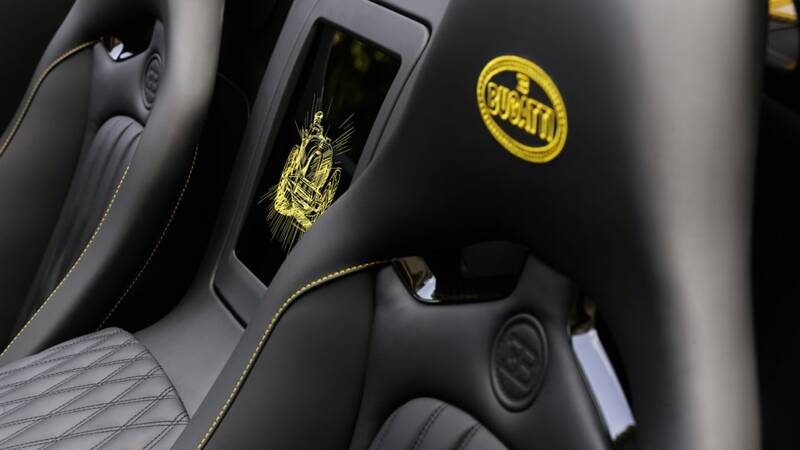 Inside the car, the macaron is prominently embroidered in yellow in the black head rests. The interior also clearly echoes to the Bugatti family colours. The complete interior is trimmed in black leather. The instrument panel is made of deep-black exposed carbon. The yellow decorative stitching on the steering wheel, seats and gear selector lever seems to glow. Gracing the cabin is a shining yellow Bugatti Type 35, the most successful racing car ever with more than 2,000 victories and podium finishes, and one of the brand's most symbolic models. At the customer's request, a sketch of the Type 35 executed by a Bugatti designer has been rendered in the black carbon lid of the rear centre box between the seats. The link to the modern history of Bugatti is created on the black door panels. 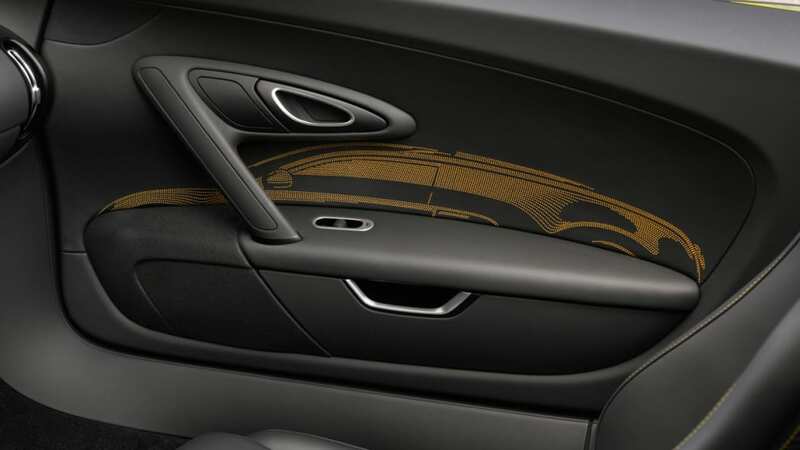 A new production technique was used for this: the door panel is made from due-tone leather, black on the outside and yellow on the inside. The leather was perforated with a laser so that the holes exposed the inner yellow layer. The result is a silhouette of a Bugatti Veyron. Of course, the classic methods of customising were also used in the Grand Sport Vitesse "1 of 1". 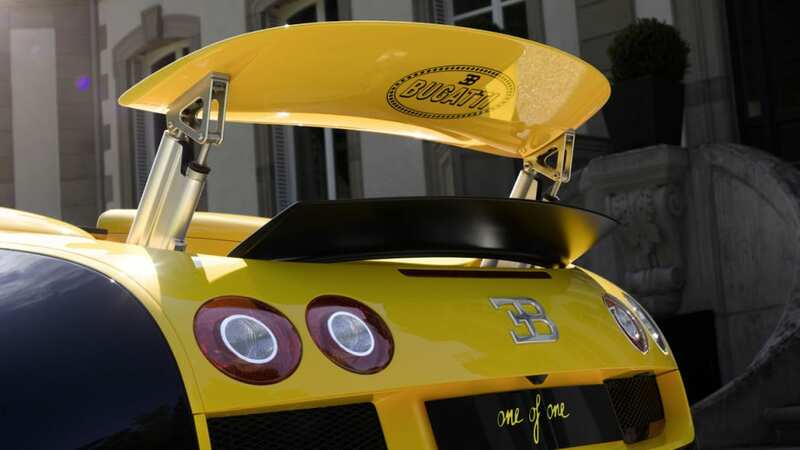 For example, the Bugatti logo and the text "one of one" – both in yellow – decorate the black carbon inlays on the extension of the centre console. As a very personal touch, the Bugatti designers created a portrait of the customer and engraved it together with his name in the door sill trim. The Bugatti Veyron enjoys the reputation of being a unique masterpiece. Its market launch almost ten years ago revitalised the French luxury brand's legendary automotive tradition characterised by superlatives. The Veyron is the most powerful and fastest production sports car in the world. Bordering on the limits of technological possibility, it is nevertheless endowed with great day-to-day practicality because it is both easy and intuitive to drive as well as being comfortable. The Grand Sport Vitesse "1 of 1" is the result of many months of close cooperation between Bugatti's design team and the customer. Focusing on the customers and their wishes is one of the brand's great strengths. In the spirit of Ettore Bugatti, whose motto was "Nothing is too expensive, nothing is too beautiful", the company continues to work in partnership with its customers to design vehicles which express both the legend of the brand and the personality of the customers. "A Bugatti is purchased as a collector's item. As a brand, we do everything to be worthy of the trust placed in us and to maintain the sustained value of this automotive icon," notes Wolfgang Dürheimer. 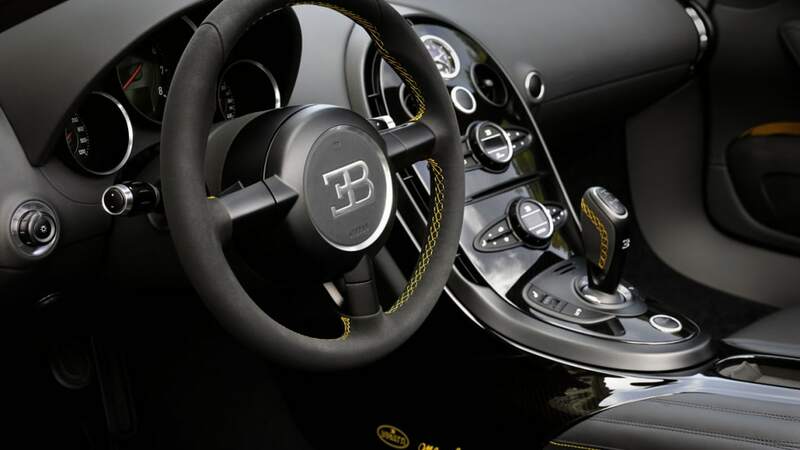 "This means that we also support our customers in the personalisation of their Bugatti in the way they would like it. Our customers' wishes are our highest priority." The average net price of Bugatti vehicles sold, including options, is presently more than €2 million. For example, the clear-coated exposed carbon-fibre body is very popular. To go with it, Bugatti now offers nine colours, more than any other manufacturer. The French luxury brand presently offers more than 100 different colours for fully painted carbon-fibre bodies. Bugatti also works passionately to satisfy its customers' wishes regarding the colours for the leather in the interior or the selection of exclusive materials such as gold, platinum, porcelain, crystal glass and more.